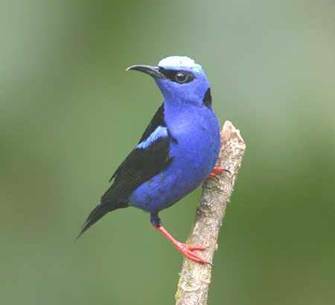 "Best value worldwide birding tours"
Flight from London via Miami to San Jose and transfer to a very comfortable hotel. We started with an early morning walk around the lovely hotel grounds. White-tailed Kite, Red-billed Pigeon, Blue-and-white Swallow, Rufous-tailed Hummingbird, Hoffmann's Woodpecker, Plain Wren, Tennessee & Yellow Warblers, Baltimore Oriole, Melodious Blackbird, Blue-grey Tanager, White-eared Ground-sparrow, and a pair of the extremely local Prevost's Ground-sparrows provided an excellent welcome to Costa Rica. At a nearby dam en route to the Pacific lowlands we found Anhinga, Least Grebe and Blue-winged Teal. Further down the road in the central park of a small town we added White-winged Dove and Hoffmann's Two-toed Sloth, but the highlight here was a Black-and-white Owl roosting in full view. Later on, while scanning the banks of the Tarcoles River we saw more than 30 American Crocodiles, some measuring nearly 15 ft. in length! The avifauna here was also impressive and included Osprey, Wood Stork, White Ibis, Tricolored, Little Blue & Green Herons, Great & Snowy Egrets, the local Collared Plover, Common Ground-dove and Groove-billed Ani. Just a few minutes later we enjoyed watching about 35 Scarlet Macaws feeding in a large roadside tree, WOW! After lunch we birded the hotel grounds and added Bare-throated Tiger-heron, White-tipped Dove, a nesting pair of Fiery-billed Aracaris, Steely-vented Hummingbird, Streak-headed Woodcreeper, Boat-billed, Streaked and Great Crested Flycatchers, Rufous-naped Wren, Philadelphia, Yellow-throated & Yellow-green Vireos, Yellow-crowned & Yellow-throated Euphonias, and the colourful Golden-hooded Tanager. In the afternoon we took a boat ride on the tranquil Tarcoles River. Before boarding our comfortable covered boat we were able to locate Orange-chinned & Orange-fronted Parakeets, Ferruginous Pygmy-owl, Ruddy Ground-dove, the awesome Turquoise-browed Motmot, and several Scaly-breasted Hummingbirds. The highlights whilst on the river included Roseate Spoonbill, hundreds of Magnificent Frigatebirds, thousands of Brown Pelicans, Neotropic Cormorant, Yellow-crowned Night-heron, several roosting Boat-billed Herons, Short-billed Dowitcher, Spotted Sandpiper, Black-necked Stilt, Mangrove Black-hawk (split from Common Black-hawk), Grey-headed & Plumbeous Kites, a roosting Lesser Nighthawk, Mangrove Swallow, Amazon & Green Kingfishers, the diminutive American Pygmy-kingfisher, Panama Flycatcher, Mangrove (Yellow) Warbler, and the brightly coloured Prothonotary Warbler. A truly great way to start the tour! A short distance from the hotel we began our morning bird walk. The large trees and numerous vine tangles soon came alive with Blue Ground-dove, Canivet's Emerald (split from Fork-tailed Emerald), Slaty-tailed Trogon, Chestnut-backed Antbird, the tiny Northern Bentbill, Rufous-breasted Wren, Rufous-capped Warbler, Summer Tanager, Rose-breasted Grosbeak, and a stunning pair a Painted Buntings all being noted. After a short drive we started birding the River Trail within the much renowned Carara National Park. Some of the many highlights from the morning walk included 3 King Vultures, Grey & Zone-tailed Hawks, several Double-toothed Kites, Long-billed Hermit (Long-tailed), several male Blue-throated Goldentails, Charming Hummingbird (Beryl-crowned), Black-headed Trogon, Rufous-tailed Jacamar, Lineated Woodpecker, Cocoa Woodcreeper (split from Buff-throated Woodcreeper), Tawny-winged & Northern Barred Woodcreepers, Black-hooded & Barred Antshrikes, Dusky Antbird, Masked & Black-crowned Tityras, Black-tailed & Ochre-bellied Flycatchers, the tiny Slate-headed Tody-Tyrant, Greenish Elaenia, the local and secretive Black-bellied Wren, Northern Waterthrush, Red-legged Honeycreeper, Grey-headed & White-shouldered Tanagers, Cherrie's Tanager (split from Scarlet-rumped) and Variable Seedeater. Other creatures found along the trail were Spiny-tailed and Green Iguanas, Common Basilisk, and a large troop of White-faced Capuchin Monkeys. After a break during the heat of the day we were off again searching for more target birds of the area. Just after entering the primary forest we had good looks of the secretive Grey-chested Dove. Further along we added Crested Guan, Ruddy Quail-dove, Black-throated & Baird's Trogons, Chestnut-mandibled Toucan, Rufous-winged Woodpecker, White-whiskered Puffbird, Black-faced Antthrush, fantastic views of Streak-chested Antpitta, Dot-winged Antwren, displaying Orange-collared Manakins, Red-capped & Blue-crowned Manakins, Rufous Mourner, Riverside Wren, and the attractive Orange-billed Sparrow. Also encountered were several Central American Agoutis, a large interesting forest rodent. After the evening bird log we successfully found a stunning Striped Owl perched on a power line not far from the hotel. A great end to a great day! After an early breakfast we returned to the mangroves around Tarcol Lodge, en route we found a male Ruby-throated Hummingbird, several migrating Cliff Swallows, a pair of Ferruginous Pygmy-owls, Rose-throated & White-winged Becards, Orchard Oriole, and Stripe-headed Sparrow. While birding the dry scrub and edges of the mangroves we were able to locate Laughing Falcon, Inca Dove, the local and endemic Mangrove Hummingbird, Cinnamon Becard, Yellow Tyrannulet, the local Northern Scrub-flycatcher, Southern Beardless-tyrannulet, Scrub Greenlet, the local Mangrove Vireo, and a spring plumage male Northern Parula (very rare in Costa Rica). Birding the river mouth and mud flats behind Tarcol Lodge produced several new species such as Elegant & Royal Terns, Laughing Gull, Whimbrel, Willet, Western & Least Sandpipers, and the scavenging Yellow-headed Caracara. After a nice lunch made special by the Tarcol Lodge staff we set off to the north and the town of Liberia. En route we came across a single Double-striped Thick-knee trying to keep cool underneath a roadside bush, certainly a nice find! At a wetland area near the coast we found Semipalmated Sandpiper and a flock of about 30 Black Skimmers. After arriving and getting set up in our new hotel we utilised the late afternoon light to find a pair of brilliant Spot-breasted Orioles, Scissor-tailed Flycatcher, and Western Kingbird. After breakfast we departed for the Palo Verde Reserve located about an hour away from our hotel. This unique dry habitat, called Guanacaste, is home to many specialities not possible elsewhere on the tour. During the drive we saw many new species such as American Kestrel, Roadside Hawk, Northern Caracara (Crested), a covey of Spot-bellied Bobwhites, perched White-fronted & Yellow-naped Parrots, Canivet's Emerald, Cinnamon Hummingbird, Brown-crested Flycatcher, White-throated Magpie-Jay, a pair of Streak-backed Orioles, Red-winged Blackbird and Eastern Meadowlark. Above the entrance gate we had excellent views of a soaring Zone-tailed Hawk. Despite driving winds inside the reserve, which never let up, we were able to find Thicket Tinamou, a pair of nesting Pale-billed Woodpeckers, Nutting's Flycatcher, Banded Wren, and a pair of dainty White-lored Gnatcatchers. Also noted were several troops of White-faced Capuchin Monkeys, and several very loud Mantled Howler Monkeys. A large wetland area further inside the reserve was loaded with waterfowl, and here we were able to track down Snail Kite, Glossy Ibis, Limpkin, American Coot, the extremely local Masked Duck, Fulvous & Black-bellied Whistling-Ducks (thousands of the latter), and about a dozen Muscovy Ducks. After lunch we made our way up to the cooler climes of Monteverde, and a much-appreciated change of weather. Arriving late in the afternoon we still had enough light to find Black Guan, Blue-crowned Motmot, the skulking Slaty-backed Nightingale-thrush, Yellowish Flycatcher, and the agile Slate-throated Redstart. We soon made our way up to the Monteverde Cloud Forest Reserve, a privately owned reserve dedicated to wildlife preservation. A fruiting tree near the entrance came alive with Black-faced Solitaires, at one time there were 3 on the ground a mere 10 ft. away posing for pictures. The Black-faced Solitaire is usually a difficult species to obtain good views of! Other birds enjoying the bounty of fruit included Black Guan, White-throated & Mountain Thrushes, and Olive-striped Flycatcher. At the hummingbird gallery a few meters away we were soon enjoying our first real experience with hummers at close range. The large and colourful Violet Sabrewings were everywhere, and almost seemed more interested in chasing off the other hummers than feeding. The feeders also held Green Violet-ear, Green-crowned Brilliant, Purple-throated Mountain-gem, Striped-tailed Hummingbird, the amazing Magenta-throated Woodstar, and the endemic Coppery-headed Emerald. A quick visit by an Orange-bellied Trogon seen from a distance of about 10-ft away was certainly memorable. Soon after starting our first trail we found one of the most sought after birds in Central America, a male Resplendent Quetzal, which was truly resplendent! Later we encountered several mixed feeding flocks. Birds noted were Ruddy Treerunner, Spotted Barbtail, Spotted Woodcreeper, Lineated Foliage-gleaner, Eye-ringed Flatbill, Ochraceous Wren, Three-striped Warbler, Black-throated Green & Golden-winged Warblers, and the abundant Common Bush-tanager. Certainly a highlight of the morning was a Silvery-fronted Tapaculo that responded well and sat right out in the open for everyone to see, WOW! Other great birds seen on the morning walk were Immaculate Antbird, a nesting pair of Grey-throated Leaftossers, Azure-hooded Jay, and a covey of somewhat tame Black-breasted Wood-quails. After lunch, and a nice siesta, we drove a short distance to the nearby Finca Ecologica. While hiking the forested canyon trails within this small reserve we came across several of our target species including Golden-olive Woodpecker, the gorgeous Long-tailed Manakin, Orange-billed Nightingale-thrush, Rufous-and-white Wren, Wood Thrush, Rufous-browed Peppershrike, Golden-crowned & Black-and-white Warblers, and the secretive Ovenbird. Our first snake of the tour was a Striped Palm Pit-viper seen coiled high overhead in a large tree. Several groups of the inquisitive White-nosed Coatis were seen foraging at close range, as well as a single Mexican Hairy Porcupine. Having missed the Chiriqui Quail-dove on the previous afternoon we decided to got back to the Finca and give it another try. This paid off and we were soon watching a pair of these bright orange/rufous doves right by the headquarters. After breakfast we packed up and set off for La Selva via Lake Arenal. Several new birds were added along the drive and these included American Swallow-tailed Kite, the huge Ringed Kingfisher, the colourful Keel-billed Toucan, and great views of Grey-crowned Yellowthroat. While birding a small forest patch near the lake we were able to find Broad-billed Motmot, Swainson's Thrush, Southern & Northern Rough-winged Swallows, and a spring plumage male Mourning Warbler. Other birds noted along the drive to our hotel were Grey Hawk, Striped Cuckoo, Common Tody-flycatcher, and Giant Cowbird. After an early breakfast and a short drive we started birding the entrance road that leads into the La Selva Reserve. Green Ibis, huge kettles of migrating Broad-winged & Swainson's Hawks, thousands of migrating Turkey Vultures, perched Mealy Parrots & White-crowned Parrots, a flock of about 15 Olive-throated Parakeets, Squirrel Cuckoo, Lesser Swallow-tailed Swift, close range views of both Chestnut-coloured & Rufous-winged Woodpeckers, Long-billed Gnatwren, several Snowy Cotingas (one male in particular showed very nicely), Bright-rumped Attila, Eastern Kingbird, the skulking Black-throated Wren, Band-backed Wren, a pair of magnificent Yellow-tailed Orioles, Montezuma & Chestnut-headed Oropendolas, Yellow-billed Cacique, Blue Dacnis, White-lined & Plain-coloured Tanagers, Greyish, Black-headed & Buff-throated Saltators, and Black-striped Sparrow were all seen well before entering the main reserve. La Selva is certainly one of the best birding destinations in Costa Rica and it provided us with a multitude of new species. Some of the best birds seen on the morning walk were Great Tinamou, the rare Tiny Hawk, male Bronze-tailed Plumeleteer (Red-footed), Blue-chested & Violet-headed Hummingbirds, Violaceous Trogon, a pair of White-necked Puffbirds, Western Slaty Antshrike, Purple-throated Fruitcrow, close range scope views of the minuscule Black-capped Pygmy-tyrant perched on a small branch just above the ground (this is normally a neck-breaking canopy species), a pair of skulking White-breasted Wood-wrens, Olive-backed Euphonias, scope views of a male Shining Honeycreeper, and the awesome Scarlet-thighed Dacnis. Plain-brown & Northern Barred Woodcreepers, Black-faced Antthrush, and the 3 gorgeous Ocellated Antbirds were all seen well at an army ant swarm we came across just before lunch. After a pleasant lunch at the headquarters we explored several new trails and found Dusky-faced Tanager, the huge Rufous Motmot, a pair of the rarely seen Central American Pygmy-owls (split from Least Pygmy-owl), Great & Fasciated Antshrikes, and the attractive White-collared Manakin. A Satiny Parrot Snake, which measured about 5-6 ft. in length, was also seen as it slowly moved off the pathway in front of us. It seemed like the rain would never end, but by mid-morning it finally let up and we started exploring Braulio Carillo National Park, about an hour drive from our hotel. Short-billed Pigeon, Emerald Tanager, Tawny-capped Euphonia, and Scarlet-rumped Cacique at the entrance gate were all welcome additions to our fast growing bird list. The trails were a little slow at first, due to the heavy rain showers, but soon we encountered our first mixed feeding flock of the morning. Birds observed in the fast moving flock included Buff-throated Foliage-gleaner, the local Ashy-throated Bush-tanager, Olive Tanager, and several Black-faced Grosbeaks. Soon after, we found the stunning Lattice-tailed Trogon. Another nice find was a silvery/white coloured Ghost Bat (rarely seen) roosting underneath a large palm frond. On our way back to the car park we had close range scope views of the shy Black-headed Nightingale-thrush. While exploring a trail further up the road from the headquarters a few were able to find the tiny Ruddy-tailed Flycatcher and a female White-ruffed Manakin. The birding was slow at first, but we did locate a large flock as we were leaving, new birds seen were Cinnamon Woodpecker, Plain Xenops, Russet Antshrike, Yellow-margined Flycatcher, Striped-breasted Wren, and a pair of White-throated Shrike-tanagers. Once back in the car park and ready to have lunch we got a tip from some visiting birders about a nearby army ant swarm. We soon located the swarm thanks to the loud and excited calls of the Bicoloured Antbird. While birding the fringes of the swarm we located a male Spotted Antbird, several Bicoloured Antbirds, and yet another Ocellated Antbird. The highlight here though, was the rare and spectacular Black-crowned Antpitta, seen preening for several minutes in full view, WOW! Soon after leaving the ant swarm we tracked down a pair of calling Red-fronted Parrotlets (rare in Costa Rica) perched atop a large fruiting tree. At a stop on the way back to the La Selva area we were able to find the giant Pink-billed Seed-finch (Nicaraguan), Olive-crowned Yellowthroat, and a juvenile Peregrine Falcon, which almost caught a Green Ibis in flight. A Nine-banded Armadillo was also seen at close range oblivious to our presence. A quick stop back at the La Selva entrance road turned up a pair of Blue-black Grosbeaks, and nice views of Red-lored Parrot. Just before entering the hotel gates we had great views of a Common Pauraque frozen in the bus headlights. After dinner a member of the hotel staff pointed out a gorgeous Central American Coral-snake to those interested. After hearing Spectacled Owl on several previous occasions we decided to wake up early and give it one last chance. We were soon rewarded with smashing views of this huge, magnificent owl no more than 100 ft. from the dining hall. After breakfast and saying good-bye to the friendly hotel staff we departed for La Virgen del Socorro, a large forested valley not far from San Jose. At a small lake en route we found Pied-billed Grebe, Slaty Spinetail and White-collared Seedeater. It was an especially good day for raptors in the valley and we soon logged a pair of Black Hawk-eagles, perched views of Barred Hawk (Black-chested) & Short-tailed Hawks, Broad-winged Hawk, and several American Swallow-tailed Kites. Other birds seen as we made our way down the steep valley to the river were Smoky-brown Woodpecker, nesting Black-headed Tody-flycatcher, and close range scope views of a singing Nightingale Wren (a master skulker of the thick undergrowth). From the large bridge at the bottom we added American Dipper, Black Phoebe, a pair of nesting Torrent Tyrannulets, Golden-bellied & Tufted Flycatchers, Louisiana Waterthrush, and a pair of Collared Trogons. A small trail paralleling the river held Pale-vented Thrush, Slaty-capped Flycatcher, the minute Scale-crested Pygmy-tyrant, and a pair of timid Sooty-faced Finches. Just before leaving, a male Slate-coloured Grosbeak was spotted and we all enjoyed scope views of this beautiful and localised species. A stop at a hummingbird gallery higher up in the valley produced several new and exciting birds for us. Blue-throated (Emerald) Toucanet, Prong-billed & Red-headed Barbets, and Silver-throated Tanagers all showed off their flashy colours. But it was the hummers that stole the show with 8 species being noted at point-blank range. The tiny Green Thorntail and the appropriately named Brown Violet-ear were both new. Moving on to Savegre Mountain Lodge on the afternoon, we were able to locate the elegant Long-tailed Silky-flycatcher, Buffy Tuftedcheek, Sooty Thrush, and Black-thighed Grosbeak. We started our morning in Savegre by watching sparkling hummingbirds coming to the feeders near the reception. Magnificent, Scintillant & Volcano Hummingbirds, White-throated Mountain-gem (Grey-tailed), and Green Violet-ear were all in attendance, as we got ready for the morning bird walk. Birds seen on the morning outing were Red-tailed Hawk, the shy Highland Tinamou (only seen by some), Band-tailed & Ruddy Pigeons, excellent scope views of the nomadic Sulphur-winged Parakeet, several male Resplendent Quetzals, Acorn & Hairy Woodpeckers, Spot-crowned Woodcreeper, Barred Becard, amazing views of the local Ochraceous Pewee, Black-capped Flycatcher, Mountain Elaenia, Brown-capped & Yellow-winged Vireos, Collared Redstart (abundant), the flamboyant Flame-throated Warbler, Townsend's, Wilson's & Black-cheeked Warblers, Sooty-capped Bush-tanager, Spangle-cheeked & Flame-coloured Tanagers, a pair of Large-footed Finches, Slaty Flowerpiercer, and Yellow-bellied Siskin. In the afternoon we drove to the upper ridge several kilometres from the hotel in search of area specialities. Black-billed Nightingale-thrush, Silvery-fronted Tapaculo, Chestnut-capped Brush-finch, and a large group of the enigmatic Silvery-throated Jays were all noted. At dusk we were able to lure in a male Dusky Nightjar to within 20 ft. away and obtain fantastic views. A short walk before breakfast proved worthwhile as we had spectacular views of 3 Spotted Wood-quails foraging along the edge of the trail. After breakfast and with all our gear loaded we drove up to Cerro de la Muerte (Mountain of Death), a high peak (around 12,000 ft.) in the Talamanca Range. In the unique Paramo habitat we quickly found the localised Volcano Junco, and the tiny Timberline Wren. A stop further down the mountain at a small roadside hummingbird gallery enabled us amazing views of at least 10 Fiery-throated Hummingbirds. At another location en route to Rancho Naturalista we were able to track down the localised Sedge Wren, and several Solitary Sandpipers. After getting situated in the comfortable rooms at Rancho Naturalista we visited the famous Hummingbird Pools, located about 200 meters from the lodge. We were soon watching several species of dazzling hummers such as the tiny Snowcap, Violet-crowned Woodnymph, and the colourful Purple-crowned Fairy. However, the highlights here were Dull-mantled Antbird and a Tawny-throated Leaftosser, which came down to bath right at dusk. Starting at first light on the balcony, coffee in hand, we soon located an adult Collared Forest-falcon perched atop a distant tree. The multiple garden bird feeders soon drew quite a selection of interesting species, and before breakfast we had logged Grey-headed Chachalaca, Collared Aracari, Blue-crowned Motmot, Green-breasted Mango, the colourful Black-cheeked Woodpecker, Brown Jay, Chestnut-sided & Mourning Warblers, the brilliant Crimson-collared Tanager, and Yellow-faced Grassquit. Soon after breakfast we found a singing Tawny-chested Flycatcher, and were rewarded with fantastic views of this extremely localised species. Green Hermit, Brown Violet-ear, Snowcap, Green Thorntail, Rufous-tailed Hummingbird, White-necked Jacobin, Violet Sabrewing, Green-crowned Brilliant, and Violet-crowned Woodnymph were all present at the forest hummingbird feeders. New birds on the morning bird walk were Wedge-billed & Olivaceous Woodcreepers, Slaty Antwren, Tawny-crowned Greenlet, White-crowned Manakin, Sulphur-rumped Flycatcher, Blue-winged & Kentucky Warblers, and Red-throated Ant-tanager. After lunch, we were able to find White-throated Spadebill and the shy Scaly-breasted Wren (Whistling). The extremely shy Purplish-backed Quail-dove proved to be difficult, but several people managed to see a pair before they walked away into the dense undergrowth. After a two-hour drive to Tapanti National Park we began birding around the headquarters where we encountered a small flock which, produced Streaked Xenops (rare in Costa Rica), and several brightly coloured Golden-browed Chlorophonias. Several tiny Alfaro's Pygmy-squirrels were then found and scoped for those interested. Further inside the park, we came across a very tame Black Guan, Black-bellied Wood-quails with 4 tiny chicks, several large flocks of White-collared Swifts, White-bellied Mountain-gem, Black-bellied Hummingbird, Green-fronted Lancebill (briefly by some), Red-faced Spinetail, Eastern Wood-pewee, and several Black-and-yellow Silky-flycatchers. We departed after lunch to a nearby hotel for coffee and to search for the local White-naped Brush-finch (Yellow-throated). It only took a few minutes until we were watching this colourful finch feeding in the bushes just outside the dining hall. Also, several people had great views of a Black Hawk-eagle, which flew past and perched for a few minutes before disappearing. About an hour down the road we stopped at a large dam, here we had great close range scope views of 2 Bat Falcons. On our way back to Rancho we saw Killdeer, American Purple Gallinule, Northern Jacana, Black-crowned Night-heron, and nice views of Crimson-fronted Parakeet. After a short drive from Rancho, we began our hike into the beautiful Tuis River Valley. The brightly coloured Bay Wren responded well and was the first new bird of the day. The highlight of the morning however, was a pair of Lanceolated Monklets seen at very close range. We all had fantastic scope views, enabling us to savour every detail of this rarely-seen species. Other nice birds seen on the morning bird walk included a nesting Golden-olive Woodpecker, Grey-capped & Piratic Flycatchers, Red-eyed Vireo, Buff-rumped Warbler, Blackburnian Warbler, White-vented Euphonia, and the spectacular Speckled Tanager. Once back at Rancho, a male Black-crested Coquette was found from the balcony. The best bird noted on the afternoon walk at Rancho was a singing Thrush-like Schiffornis, eventually seen well by everyone. After missing White-throated Crake on several previous occasions we decided to try our luck one last time on the final morning. At a nearby marsh we found one individual to be responsive and it finally came out into full view. The local White-throated Flycatcher was spotted, and an adult Peregrine Falcon was seen trying to catch a Cattle Egret in flight above the marsh, what an exciting chase! After breakfast, we returned to San Jose at the end of the tour with an amazing group total of 504 species.